Well, it’s time to return to RPGs with the Bio Break classic safari series, so get your vote in on which title I should play through next! As I’m sitting here in Seattle waiting for the PAX craziness to start, I figure it’s as good as any time to have a final Master of Orion session. I think I’m definitely at a point where I want to move on to a new game and want to quit while I’m still somewhat happy with this particular playthrough instead of getting too frustrated. So when you know you’re going to go out, you might as well go out with a bang. 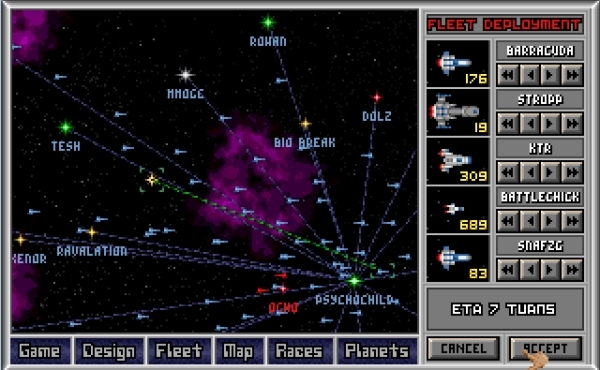 I gather up my entire fleet and give them one suicidal order: storm the gates of Orion. Take on the Guardian. See if we can defeat him, but if not, just fold gracefully. Genocide! It makes for good ratings, I guess. You don’t have to look so smug about it, tho. Since my planets keep churning out ships, I form a second fleet and wing them Ysharros’ way, just for the heck of it. Sometimes not caring at all can be a joy in and of itself. His opening move? Giant fireball of doom. Hm. It… doesn’t go well for me. At all. Actually, my ships do hang in there far longer than I expected. The Guardian moves really fast and can hit my ships from across the screen, while my guys have to plod over no man’s land just to get within point-blank range to shoot. Still, the battle lasts for 30 seconds and I see all sorts of neat effects. My final ship? A lone Battlechick fighter. Because MOO doesn’t really show you hit points unless you use certain tech on your ships to show it, I have no idea what the Guardian was at when I was obliterated. Probably 100% health. Man, that brings me back. Those random events do help a lot to keep games from becoming stale. So we come to the end of this Master of Orion playthrough. It was, to use a tired term, a blast. I was a little worried that it wouldn’t retain the same charm that it had in the mid-90s, but that wasn’t the case at all. 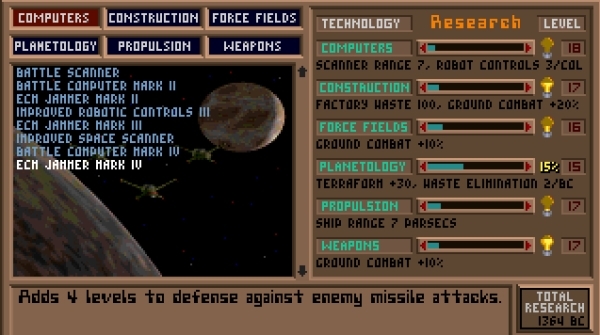 There’s still a lot to love about the game: delightfully retro pixel graphics, an easy-to-understand interface, fun tech trees, and the joy of building a galactic empire. I think a lot of you hit it on the head when you’ve commented that the real strength of the 4X games is the freedom to create and tell your own story, the story of an empire. The Bio Break empire might not have been successful in the end — for many reasons that are obvious looking back now — but it was a great ride. Sure, there are several things that I would love to see changed if someone was going to update this for modern sensibilities. Faster map movement (the click-to-move-the-map thing is so annoying), for one. More ship icons — there are way too few of them. A better AI. 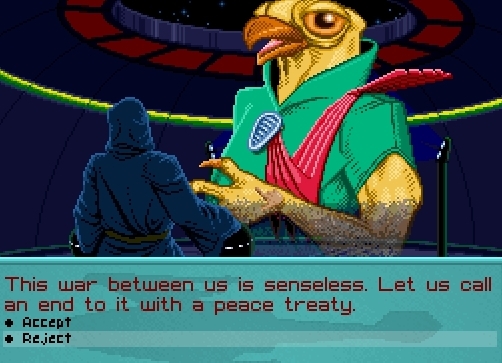 A diplomacy system that isn’t just “war” or “not war”. A trade system. But overall? It’s a great game that I recommend to any of you that found this playthrough entertaining. 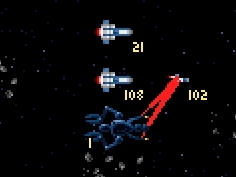 It plays wonderful today, shining with that Microprose polish that I loved back in my youth. Perhaps one day I’ll get around to MOO2, a game that I really don’t have much experience with at all. But not today. This is one of my big “must have’s” of the year based on my time in the beta, and I cannot wait to get in and collecting gear, stomping enemies, and reliving my non-existent PnP D&D days. Everyone says that the completely free option is pretty generous, but I’m excited enough to want to buy the basic edition special for $25. Maybe that’s just the heat of the moment talking, so we’ll see. Anyway. So pumped up for this! Just wish I had it on a tablet for the plane tomorrow. It’s fun watching this particular series resonate with players; Master of Orion and many of the 4X games have special places in gamers’ hearts, and Ocho has a great explanation why: We create our own stories. I agree. I love being told stories and experiencing them in MMOs, but I also love making them. It doesn’t have to be a one-or-the-other proposition. 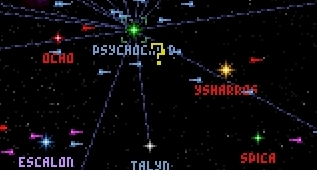 Back to the game… I’m marshaling my forces for a strike on the nearby Alkari planet of Spica, but even so I’m keeping close tabs on the map in case I see the enemy trying to strike out first. Nine of my Teppo-class bombers are ready and I send them to the front line. I’m also starting to think that it’s about time to spin down the KTR production and switch everyone over to a new ship with a more modern arsenal. My research monkeys (silicon monkeys, rimshot) keep coming up with new tech quite fast, and I hope I’m pulling ahead in the research race at this point. The new Hoppy-class battleships are filled to the brim with the latest and greatest: top-notch shielding, armor, countermeasures, and engines. Defensively they’re great, but offensively they’re a little lacking. 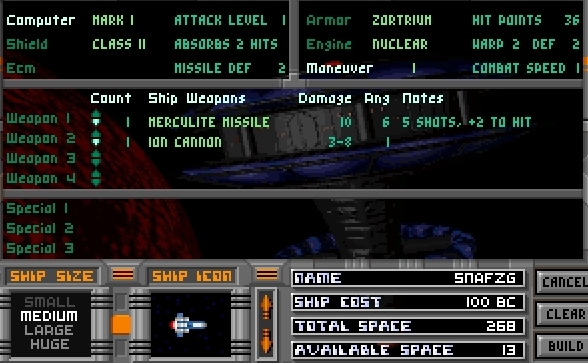 I do have some of the new missiles in them and a few other weapons, but they’re more made for slugging than fast strikes. I convert all my production over to making them. The Alkari seem to be doing the opposite, favoring mass production of fighters — 1600 of them, plus assorted other ships, are heading back toward Ysharros. Well, this will be interesting. It almost doesn’t matter how advanced my ships are; 1600 of anything is going to steamroll them. 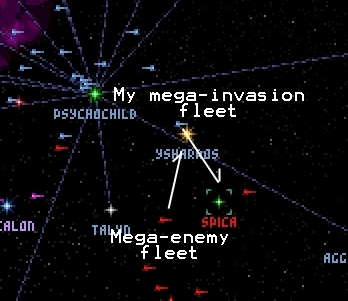 And I am NOT prepared to lose my fleet. Best case scenario is that we trade planets, but I’m hoping that the Alkari will get their nose really bloodied and freak out over their planet. I know, that’s a lot to put on the AI. In the end, we both obliterate each other’s colonies, although I lose a heck of a lot of KTRs in the process and the enemy doesn’t lose a single ship. Mutual assured destruction, my friends. The Darlocks freak and say that I don’t have honor because I’m using biological weapons. So… using nukes was fine? And it was hunky dory when the Alkari were raining death spores down on Werit and Ocho? But this crosses the line? I console myself with the fact that I have planets I can afford to lose while the Alkari do not. Plus, I start production on small agile Battlechick fighters and crank out a few hundred of them on the first turn. I feel like everything is spinning out of my control. I know it’s boring to say this, but the most fun I have with 4X games is when I’m roflstomping over the enemy with ease, not when I’m scrabbling just to stay afloat against an enemy that I have a 2-1 planetary advantage over. It’s taking a lot of my will to play through this game and not start over. 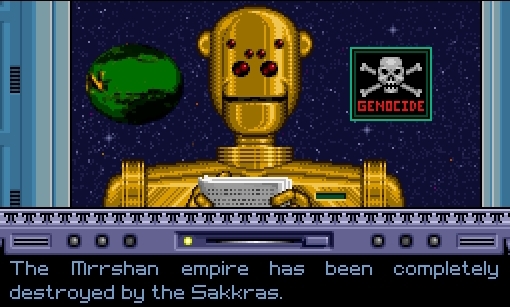 To make matters worse, a GNN report tells me that I’m #3 in fleet strength — the Alkari are #1 and the Sakkra (!) are #2. I think the Sakkra are there because they haven’t fought at all and the computer just keeps cranking out new ships. Hey, what about pouring some lemon juice in that wound? Here ya go! That’s right: The Alkari have not only managed to recolonize Spica but also Ysharros and Ocho as well. Fine. Forget getting a technological edge. I go around to all of my planets and tell them to start making ships full-on, non-stop. It’s a last-ditch effort to win; if I can’t gain a production advantage, I’m going to be sunk soon. Medium ship, so I can pump them out fast. Good speed, good defense, and two powerful weapons. Let’s do this. Every planet goes to 100% ship production and 43 Snafzgs come out on turn one. Guh? What the? At the moment of your impending victory, you just decide to call it a day? Well, I’m not going to look a space-gift horse in the mouth. I will take a stay of execution. To be honest, I’m starting to feel frustrated with this particular game (not MOO specifically, just this game of it). I shouldn’t have been so hasty to get into war in the first place, and now that I have, I’m in some sort of weird Vietnam where I can’t figure out the right way to proceed. Losing two planets in the past couple of sessions didn’t help, and knowing that two of the enemy forces can overpower me easily is aggravating. Really, if it wasn’t for this series, I would quit and restart. But I’ll see it through. At least a couple more sessions. 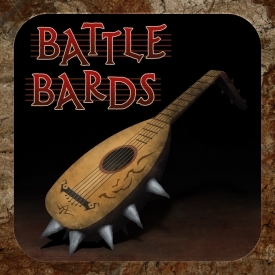 What pleases the Battle Bards? To crush their enemies, to see them driven before you, and to hear the lamentations of their husbands. Also, good music, which is why the bards are diving into the Age of Conan soundtrack this week! There are divided opinions on this incredibly popular score — listen and see where you fall! Guild Wars 2: Die Die Die, Die Die. If the Bazaar of the Four Winds and that weird election represented a low point of my recent interest in Guild Wars 2, then the combo of the Queen’s Jubilee and the Clockwork Chaos represent a rebound of tremendous proportions. Of course, maybe that’s the good thing about this “every two weeks with the new content” strategy — like everyone is fond of saying of their native state/country, “If you don’t like the weather, just wait 15 minutes.” So if you don’t like the content, just wait two weeks. What’s made me happy is that the activities of these two updates have played to GW2’s strength: Getting people together in big, happy, chaotic groups and unleashing them on bosses. It’s exactly the same thing I love about RIFT, what with the dynamic world events and all. Maybe they don’t require a lot of hard strategy and careful maneuvering, but I prefer these messy battles where craptons of stuff is going on all at the same time and everyone’s pulling together to accomplish something. Even a year after GW2’s launch, I still see players rezzing each other almost constantly, and that does make me happy. And amid the rezzes and zergs and land-rending battles, I’m a happy clam. I’m getting to play alone together as much as I like here, and I don’t have to worry about letting my team down so much as just chipping in and doing my best. Plus, the loot. Oh my goodness, the loot. I got hooked on these invasions after the first time through them, seeing how my bags grew to bursting from 45 minutes of play. Guild Wars 2 does loot right in a weird way. I mean, a lot of what I’m getting, no, I’m not going to use. But it’s fun to get it anyway, and occasionally you get the cool consumables or exotics or hugely valuable mats that make it worthwhile. And you get LOTS of it. I’m running around these invasions with my trusty flamethrower, vacuuming up loot, hoping for champions, and just really enjoying the madcap mayhem of it all. Reminded me a lot of the maze from the Halloween event. Fending off an invasion and downing Scarlet felt like a good accomplishment (and it’s nice that ArenaNet still rewards you with a consolation prize if you can’t go all the way), and I’m not complaining about all of the achievement points I’ve been getting. But the best part is after an invasion is done, I zip over to Rata Sum and spend about ten minutes sorting through all of the goods I won and selling them through the trading post and a vendor. I do keep the skill scrolls (I got about 30 of these from five or so hours of play this weekend), karma potions (um… more of these than I can count), black lion chests, and queen’s gauntlet tickets (I’m hoping that we’ll be able to sell those to a vendor after the event is done), but the rest goes on sale. I made it a goal of the weekend to raise funds to buy enough gems to afford a magitech armor set that I thought would look awesome for my engineer. Even with a spike in gem prices, it became really doable as I was pulling in 3-7 gold with each invasion. Before I knew it, I surpassed my 800 gem goal to rake in 1224 gems, and the fancy new outfit is mine (see above right). So a great weekend based on my satisfaction and accomplished goals. I’m sure that these nonstop invasions will get old after a while, but I wouldn’t mind a couple more weeks with them to pad my bank account.